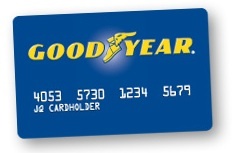 The Goodyear Credit Card - Good or Bad? If you don't buy a lot of tires (one care in the family, low miles, etc) then paying with one of your other cards or cash will likely save you money in the long run. There is something to be said for the convenience of having this credit card. Goodyear credit cards have no annual fee, and the monthly fees are reasonably low. You basically throw that puppy down at any of the 4,500+ tire centers across the country, or when you're buying your Goodyear tires online. It isn't a Visa (in case that wasn't obvious). It's ONLY for Goodyear tire purchases and cash advances. You do however get special offers and discounts on tires when you have this card. Ok, with all that said... we all know we shouldn't use a credit card unless we absolutely have to. Sometimes the benefits and/or convince is huge (like air miles) and it's worth it. If you carry a balance this card you'll be charged an APR of about 25% (OUCH!!!). They boast of low monthly payments, but you'll never pay the card off if you choose that option. $39 fee on balances of $250 and over. So our advise is to use one of your lower interest rate cards if you have one. If you ALWAYS pay your balance off, and you love Goodyear tires, then the benefits and convince of this credit card may be good for you.